Prior to January 2014, the most recent reported activity was during 12-17 June 2008, when ash plumes were seen rising to 4.5 km altitude (BGVN 33:06). Sporadic white and brownish plume emissions were noted between 2012 and early 2015, along with periods of increased seismicity and thermal anomalies. Gray plumes, presumably due to ash, were reported beginning on 1 February 2015. Seismicity and thermal anomalies preceded stronger eruptive activity that began in mid-to-late June 2015; the last reported gray plume was on 22 August 2015. Thermal anomalies also decreased after mid-August 2015. Activity during 2012-2013. Seismicity increased on 17 October 2012, prompting the Pusat Vulkanologi dan Mitigasi Bencana Geologi (PVMBG) to raise the Alert Level to 2 (on a scale of 1-4) on 18 October. During 18-22 October white plumes rose 50-75 m above the crater. Seismic activity increased significantly again on 22 October. That same day the Alert Level was raised to 3; visitors and residents were warned not to approach the crater within a 3-km radius. Strong thermal anomalies identified by MODVOLC, based on MODIS infrared satellite data, began on 14 October and continued through 8 November 2012. Two additional weak anomalies were detected on 29 November and 1 December 2012. PVMBG reported that during March 2013 white plumes rose to 400 m above the summit. Seismicity decreased significantly on 25 March; tremor was absent starting in April. On 5 April the Alert level was lowered to 2. Despite decreased seismicity, four MODVOLC thermal anomalies, based on MODIS satellite data, were recorded between 29 June and 31 July 2013. Activity during 2014. PVMBG reported that on 1 January 2014 seismicity increased. On 3 January diffuse white gas plumes rose 100 m and drifted W; on 4 January diffuse brownish plumes also rose 100 m and drifted W. On 5 January the Alert Level was raised to 2. PVMBG reported that RSAM values showed an increase in energy during March-April 2014. Also during this timeframe, the daily number of volcanic earthquakes was dominated by tremor (with an increase in tremor amplitude). However, beginning in May, the number and the amplitude of tremor decreased. During 1-17 June 2014, when weather permitted, a weak solfatara plume was visible rising up to 100 m above the summit. On 17 June the Alert Level was lowered to 1. Thermal anomalies, based on MODIS satellite data, were recorded beginning 28 November 2014 and continuing through 25 February 2015. Activity during 2015. From December 2014 through January 2015, white plumes were observed rising to 500 m above the crater rim. Throughout February and during 1-14 March plumes were gray-white and rose to a maximum height of 200 m. Crater incandescence and rumbling was also reported on 14 February. During 15 March-7 April gray-brown emissions rose to 200 m; rumbling was frequently heard. During 8 April- 21 May gray and gray-brown plumes rose to 300 m. Crater incandescence was observed again on 12 April. Seismicity fluctuated and was dominated by tremor. Rumbling was frequently heard during this interval. The Alert Level remained at 2; residents and tourists were reminded not to approach the craters within a 2-km radius. Continuous tremor was recorded during December 2014-12 January 2015; tremor was not continuous starting on 13 January, and RSAM values declined. A weak thermal anomaly was recorded on 17 April 2015. PVMBG reported that during times of clear weather during 1-28 June, white plumes were observed rising as high as 300 m above the crater rim. Rumbling was frequently heard at the observation post. Seismic tremor sharply increased on 21 June, and crater incandescence was observed on 25 and 28 June. BNPB reported that increased activity on 28 June was characterized by Strombolian activity, roaring, ash plumes that rose 300 m, and a loud thumping sound heard 20 km away at 2000. Incandescence from the crater was clearly visible from the observation post in Banyuwangi. PVMBG raised the Alert Level to 3 on 29 June, and reminded the public not to approach the crater within a 3-km radius. Based on notices from the Ujung Padang Meteorological Watch Office (MWO) and PVMBG, satellite images, and pilot observations, the Darwin VAAC reported that during 1 and 3-7 July ash plumes rose to altitudes of 3.7-6.1 km and drifted 25-110 km E, ESE, and SE. According to news articles, flights in and out of an airport in Bali were cancelled due to ash emissions during 3-4 July. On 5 July BNPB reported that roaring was heard from continuous explosions and Strombolian activity. Dense white-and-gray plumes rose as high as 400 m and drifted SE. During 1-8 July PVMBG reported that gray plumes rose 100-500 m above the crater rim, crater incandescence was observed, and rumbling and thumping noises were noted. Seismicity was dominated by high-amplitude tremor, and deformation data suggested magma migrating towards the surface. BNPB reported that gray ash plumes continued to rise as high as 500 m above the crater through 11 July (figure 5). Ash plumes drifted in various directions depending on the altitude; plumes drifted SE and S at lower altitudes and SE, S, W, and N at higher altitudes. Figure 5. Volcanic ash and clouds are illuminated by lava from the crater of Mount Raung as seen from Songgon (Banyuwangi, East Java) on 11 July 2015. Courtesy of Reuters/Zabur Karuru/Antara Foto. Based on PVMBG notices, wind data, and satellite images, the Darwin VAAC reported that during 8-12 July ash plumes rose to an altitude of 4.3-5.2 km and drifted as far as 1,040 km E, SE, and S. According to news articles, increased activity during 9-10 July caused flight cancelations and several airports to close, including airports on Bali and Lombok, as well as Banyuwangi and Jember in East Java. One article noted that dozens of flight had been canceled during the previous week. Another article noted that the Bali airport, in addition to another airport in Java, again closed on 12 July, a day after it had reopened. Information from PVMBG along with satellite-image and pilot observations, allowed the Darwin VAAC to report that during 15-21 July ash plumes rose to varying altitudes of 3.7-6.1 km and drifted as far as 340 km in multiple directions. On 16 July BNPB reported that a dense gray-to-black ash plume rose as high as 2 km above the crater rim and drifted WNW. Incandescent lava at the summit was visible, and tremor was continuous. Roaring and thumping sounds were reported by residents. Ashfall was reported in areas downwind, including Cumedak (19 km W) and Sumberjambe (13 km NW). According to a news article, the Juanda International Airport in Surabaya reopened on 17 July after on-and-off closures the previous week. BNPB noted that the eruption continued on 18 July with ash plumes rising as high as 1.5 km and drifting N. Tremor continued although the amplitude had declined during the previous week. During 16-23 July PVMBG reported ash plumes rising to 2 km, and incandescence was visible at the crater. Seismicity fluctuated but remained elevated. Based on PVMBG information, and satellite-image and pilot observations, the Darwin VAAC reported that during 22-28 July ash multiple ash plumes rose to varying altitudes of 4.3-5.2 km and drifted as far as 400 km NW, W, SSW, S, and SSE. A news article from 29 July noted that 18 flights at most had been canceled during the previous few days due to the ash plumes, and that the Notohadinegoro Airport (2,100 km SW) had been temporarily closed. On 4 August BNPB reported that during the previous three days the Strombolian eruption had increased in intensity. Ash fell in Sempu, Songgon, Glenmore, Gambiran, and Banyuwangi. On 4 August dense blackish gray ash plumes rose 800 m and drifted SE. Based on satellite-image and wind data, the Darwin VAAC reported that during 29 July-4 August multiple ash plumes rose to altitudes of 4.3-4.9 km and drifted as far as 240 km in multiple directions. PVMBG reported that during 24 July-10 August ash plumes rose 1.5 km above the crater with visible incandescence at the crater. Seismicity fluctuated but remained elevated; RSAM values peaked on 4 August (the highest recorded since the beginning of the eruption) and then decreased significantly after mid-August (figure 6). Based on satellite observations and wind data, the Darwin VAAC reported that during 12-14, 16, and 18 August multiple ash plumes rose to altitudes of 3.7-4 km and drifted 20-110 km W and WSW (figure 7). Figure 6. Realtime Seismic Amplitude Measurement (RSAM) measurements at Raung between 1 November and 21 September 2015. Courtesy of PVMBG. Figure 7. On 27 July 2015 the Operational Land Imager (OLI) on Landsat 8 captured a view of ash and volcanic gases drifting NW from Raung. The lower image shows a closer view of the volcano's caldera. Courtesy of NASA Earth Observatory; image by Jesse Allen (Landsat data from the U.S. Geological Survey) and caption by Adam Voiland. PVMBG reported that ash plumes rose as high as 1 km above the crater during 16-24 August and drifted NW. Seismicity fluctuated but continued to decrease. The Alert Level, which had remained at 3 since 29 June, was lowered to 2 on 24 August; the public was reminded not to approach the crater within a 2-km radius. Based on weather models, webcam and satellite data, pilot observations, and information from PVMBG, the Darwin VAAC reported that on 19 August ash plumes rose to an altitude of 3.7 km and drifted 65-95 km NW, WNW, and W. On 22 August a low-level ash plume drifted 55 km NW. PVMBG reported that, although inclement weather conditions often prevented visual observations during 25 August-21 September, white plumes were occasionally seen rising as high as 200 m above the crater. Seismicity fluctuated but continued to decrease. The Alert Level remained at 2 (on a scale of 1-4), and the public was reminded not to approach the crater within a 2-km radius. In 2015 the MODVOLC system using infrared MODIS satellite data indicated a small anomaly on 17 April and then steady thermal anomalies beginning 20 June. The last anomaly located at the summit crater, a single weak alert pixel recorded on 29 August 2015, was a full week after the previous anomaly was identified on 22 August. MODIS data analyzed by the Middle InfraRed Observation of Volcanic Activity (MIROVA) project from February 2015 through January 2016 (figure 8) showed a large spike in power output beginning in mid-June 2015. The slow descent after approximately the first week of August may be due to cooling of lava in the crater rather than to ongoing activity. Figure 8. MODIS data analyzed by MIROVA shows a spike in power output coinciding with the beginning of elevated seismicity and ash plumes in June 2015. Courtesy of MIROVA. Information Contacts: Pusat Vulkanologi dan Mitigasi Bencana Geologi (PVMBG, also known as Indonesian Center for Volcanology and Geological Hazard Mitigation, CVGHM), Jalan Diponegoro 57, Bandung 40122, Indonesia (URL: http://www.vsi.esdm.go.id/); Badan Nasional Penanggulangan Bencana (BNPB), National Disaster Management Agency, Graha BNPB - Jl. Scout Kav.38, East Jakarta 13120, Indonesia (URL: http://www.bnpb.go.id/); Darwin Volcanic Ash Advisory Centre (VAAC), Bureau of Meteorology, Northern Territory Regional Office, PO Box 40050, Casuarina, NT 0811, Australia (URL: http://www.bom.gov.au/info/vaac/); Hawai'i Institute of Geophysics and Planetology (HIGP), MODVOLC Thermal Alerts System, School of Ocean and Earth Science and Technology (SOEST), Univ. of Hawai'i, 2525 Correa Road, Honolulu, HI 96822, USA (URL: http://modis.higp.hawaii.edu/, http://modis.higp.hawaii.edu/); MIROVA (Middle InfraRed Observation of Volcanic Activity), a collaborative project between the Universities of Turin and Florence (Italy) supported by the Centre for Volcanic Risk of the Italian Civil Protection Department (URL: http://www.mirovaweb.it/); NASA Earth Observatory, EOS Project Science Office, NASA Goddard Space Flight Center, Goddard, Maryland, USA (URL: http://earthobservatory.nasa.gov/); ch-aviation GmbH, Quaderstrasse 8, 7000 Chur, Switzerland (URL: http://www.ch-aviation.com/portal/news/38959-surabaya-indonesia-reopens-despite-mt-raung-eruption); WA Today, East Perth, WA, Australia (URL: http://www.watoday.com.au/wa-news/volcano-causes-more-bali-flight-cancellations-20150704-gi56a5.html); The Weather Channel (URL: http://www.weather.com/news/news/indonesia-mount-raung-volcan); The National, Abu Dhabi Media, Abu Dhabi, United Arab Emirates (URL: http://www.thenational.ae/world/mount-raung-eruption-causes-closure-of-bali-airport-again); The Jakarta Post, PT Niskala Media Tenggara, Jl. Palmerah Barat No. 142-143, Jakarta 10270, Indonesia (URL: http://www.thejakartapost.com/news/2015/07/29/mount-raungs-eruption-cancels-18-flights-jember.html). PVMBG reported that, although inclement weather conditions often prevented visual observations of Raung during 25 August-21 September, white plumes were occasionally seen rising as high as 200 m above the crater. Seismicity fluctuated but continued to decrease. The Alert Level remained at 2 (on a scale of 1-4), and the public was reminded not to approach the crater within a 2-km radius. PVMBG reported that ash plumes from Raung rose as high as 1 km above the crater during 16-24 August and drifted NW. Seismicity fluctuated but continued to decrease. The Alert Level was lowered to 2 (on a scale of 1-4) on 24 August, and the public was reminded not to approach the crater within a 2-km radius. PVMBG reported that the eruption at Raung was ongoing during 24 July-10 August. Ash plumes rose 1.5 km above the crater and crater incandescence was visible. Seismicity fluctuated but remained elevated; RSAM values peaked on 4 August (the highest recorded since the beginning of the eruption) and then decreased again. The Alert Level remained at 3 (on a scale of 1-4), and the public was reminded not to approach the crater within a 3-km radius. Based on satellite observations and wind data, the Darwin VAAC reported that during 12-14, 16, and 18 August multiple ash plumes from Raung rose to altitudes of 3.7-4 km (12,000-13,000 ft) a.s.l. and drifted 20-110 km W and WSW. On 4 August BNPB reported that during the previous three days the Strombolian eruption at Raung increased in intensity. Ash fell in Sempu, Songgon, Glenmore, Gambiran, and Banyuwangi. On 4 August dense blackish gray ash plumes rose 800 m and drifted SE. Based on satellite-image and wind data, the Darwin VAAC reported that during 29 July-4 August multiple ash plumes rose to altitudes of 4.3-4.9 km (14,000-16,000 ft) a.s.l. and drifted as far as 240 km in multiple directions. The Alert Level remained at 3 (on a scale of 1-4), and the public was reminded not to approach the crater within a 3-km radius. Based on PVMBG information, and satellite-image and pilot observations, the Darwin VAAC reported that during 15-21 July ash multiple ash plumes from Raung rose to varying altitudes of 3.7-6.1 km (12,000-20,000 ft) a.s.l. and drifted as far as 340 km in multiple directions. On 16 July BNPB reported that a dense gray-to-black ash plume rose as high as 2 km above Raung's crater rim and drifted WNW. Incandescent lava at the summit was visible and tremor was continuous. Roaring and thumping sounds were reported by residents. Ashfall was reported in areas downwind, including Cumedak (19 km W) and Sumberjambe (13 km NW). According to a news article, the Juanda International Airport in Surabaya reopened on 17 July after on-and-off closures the previous week. BNPB noted that the eruption continued on 18 July with ash plumes rising as high as 1.5 km and drifting N. Tremor continued, although the amplitude had declined during the previous week. The Alert Level remained at 3 (on a scale of 1-4), and the public was reminded not to approach the crater within a 3-km radius. PVMBG reported that during 1-8 July gray plumes rose 100-500 m above Raung’s crater rim, crater incandescence was observed, and rumbling and thumping sounds were noted. Seismicity was dominated by high-amplitude tremor; deformation data suggested magma migrating to the surface. The Alert Level remained at 3 (on a scale of 1-4), and the public was reminded not to approach the crater within a 3-km radius. BNPB reported that gray ash plumes continued to rise as high as 500 m above the crater through 11 July. Ash plumes drifted in various directions depending on the altitude: SE and S at lower altitudes and SE, S, W, and N at higher altitudes. Based on PVMBG notices, wind data, and satellite images, the Darwin VAAC reported that during 8-12 July ash plumes rose to an altitude of 4.3-5.2 km (14,000-17,000 ft) a.s.l. and drifted as far as 1,040 km E, SE, and S. According to news articles, increased activity during 9-10 July caused flight cancelations and several airports to close, including those on Bali and Lombok, and in Banyuwangi and Jember in East Java. The article also noted that dozens of flight had been canceled during the previous week. Another article noted that the Bali airport, in addition to another airport in Java, again closed on 12 July, a day after it had reopened. Based on notices from the Ujung Padang MWO and PVMBG, satellite images, and pilot observations, the Darwin VAAC reported that during 1 and 3-7 July ash plumes from Raung rose to altitudes of 3.7-6.1 km (12,000-20,000 ft) a.s.l. and drifted 25-110 km E, ESE, and SE. According to news articles, flights in and out of an airport in Bali were cancelled due to ash emissions during 3-4 July. On 5 July BNPB reported that roaring was heard from continuous explosions and Strombolian activity at Raung. Dense white-and-gray plumes rose as high as 400 m and drifted SE. The Alert Level remained at 3 (on a scale of 1-4), and the public was reminded not to approach the crater within a 3-km radius. PVMBG reported that, during times of clear weather during 1-28 June, white plumes were observed rising as high as 300 m above Raung's crater rim. Rumbling was frequently heard at the observation post. Seismic tremor sharply increased on 21 June, and crater incandescence was observed on 25 and 28 June. BNPB reported that increased activity on 28 June was characterized by Strombolian activity, roaring, ash plumes that rose 300 m, and a loud thumping sound heard 20 km away at 2000. Incandescence from the crater was clearly visible from the observation post in Banyuwangi. PVMBG raised the Alert Level to 3 (on a scale of 1-4) on 29 June, and reminded the public not to approach the crater within a 3-km radius. PVMBG reported that RSAM values from Raung showed an increase in energy during March-April. Additionally, during March-April, the daily number of volcanic earthquakes was dominated by tremor (with an increase in tremor amplitude); however, since the beginning of May, the number and the amplitude of tremor decreased. During 1-17 June, when weather permitted, a weak solfatera plume was visible rising up to 100 m above the summit. On 17 June the Alert Level was lowered to 1 (on a scale of 1-4). PVMBG reported that on 1 January seismicity at Raung increased, on 3 January diffuse white gas plumes rose 100 m and drifted W, and on 4 January diffuse brownish plumes also rose 100 m and drifted W. On 5 January the Alert Level was raised to 2 (on a scale of 1-4). CVGHM reported that during March white plumes rose at most 400 m above Raung. Seismicity decreased significantly on 25 March, and tremor was absent starting in April. On 5 April the Alert level was lowered to 2 (on a scale of 1-4). Visitors and residents were warned not to approach the crater within a 1.8-km radius. Seismicity at Raung increased on 17 October and remained elevated, prompting CVGHM to raise the Alert Level to 2 (on a scale of 1-4) on 18 October. During 18-22 October white plumes rose 50-75 m above the crater. Seismic activity increased significantly on 22 October. That same day the Alert Level was raised to 3. Visitors and residents were warned not to approach the crater within a 3-km radius. Based on observations of satellite imagery, the Darwin VAAC reported that an ash plume from Raung rose to an altitude of 4.6 km (15,000 ft) a.s.l. during 26-27 August and drifted E.
Based on a pilot report, the Darwin VAAC reported that an ash plume possibly from Raung rose to an altitude of 1.5 km (5,000 ft) a.s.l. Ash was not visible on satellite imagery. Based on pilot reports and satellite imagery, the Darwin VAAC reported that an ash plume was visible rising from Raung on 25 August at 1534. The cloud reached a height of ~9.2 km a.s.l. and drifted to the W at high levels and to the E at lower levels. The Darwin VAAC received reports stating that on 12 August at 1720 ash was visible drifting NW of Raung around summit level. The summit was partially obscured by meteorological clouds and no ash was identifiable on satellite imagery. The Darwin VAAC reported that possible ash clouds emitted from Raung were visible on satellite imagery. The clouds were at heights below 4.6 a.s.l. and were observed on 5 June at 0840 drifting to the S, on 7 June at 0934 drifting to the SW, and on 8 June at 1132 drifting to the NW. 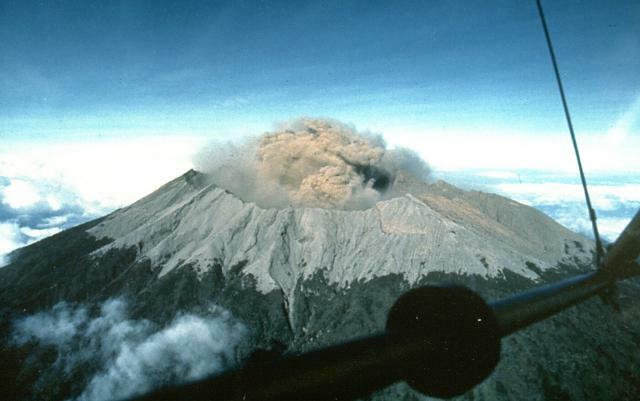 A pilot reported observing an ash plume that was emitted from Raung on 2 June at 1625. The plume rose to a height of ~4.5 km a.s.l. and drifted to the S. According to the Darwin VAAC, ash was not visible on satellite imagery. Raung erupted 18 July, emitting dark clouds of tephra to 6,000 m. Activity apparently began with a weak earth tremor at about 0300, felt by inhabitants of the tea and coffee plantations on the slopes and in the areas around Kalibaru and Glenmore, at the S foot of the volcano. On 19 July at about 0500 an earthquake was felt, and inhabitants at the foot of Raung reported hearing two consecutive explosions. A seismograph post for Ijen Volcano (8.058°S, 114.242°W) at Pal Tuding, which also monitors Raung, registered vibrations with a maximum amplitude of 3.9 mm. Two eruptions on 19 July were reported by a Garuda Airlines pilot flying from Jakarta (about 840 km NW of Raung) to Denpasar (on Bali, about 140 km SE) and back. One eruption occurred around 0511 and the other around 1130. The pilot estimated that columns of "smoke" reached 0.6-0.9 km height. Flights have been diverted from near the volcano. Ash fell lightly all day, leaving a whitish coat on the leaves of tea and coffee plants. An employee of one tea plantation said part of the top leaves were damaged and withered. Light ashfall was reported until 20 July. Information Contacts: Kompas, Jakarta; AFP. No explosions were recorded in December. Strombolian activity in the bottom of the crater was photographed by Michel Halbwach (Univ of Savoie, France) in July/August 1988, during overflights in an ultralight aircraft arranged in cooperation with the Federation Aerosport of Indonesia (FASI). Activity was continuing in March, when brownish plumes that rose 100-150 m above the summit were seen 41 times. Recorded March seismicity included: 1,771 episodes of volcanic tremor and plume emission tremor, 90 strong tectonic earthquakes, one local tectonic earthquake, and one A-type and 11 B-type volcanic earthquakes. Additional aerial monitoring of activity at Raung and other volcanoes has been proposed by FASI and VSI. During the last week of July, 45 visible explosions ejected plumes to 75-150 m above the summit before winds carried them S. Between explosions, weak white fumes reached 50 m above the crater. Recorded earthquakes were: distant tectonic (50), local tectonic (2), volcanic A-type (1), volcanic B-type (2), explosions (1,574), and volcanic tremor (1). Raung continued to emit brownish-gray ash clouds to 200-300 m above the crater, with light ashfall NW of the volcano. A daily average of 104 ash pulses, one tremor event, and two tectonic earthquakes were detected during July. The crew of Qantas flight 41 (Sydney-Jakarta) observed a very dense black plume emerging intermittently from a flank vent on 10 September at 1508. The plume was drifting N at ~6 km altitude, well below the aircraft's altitude of nearly 12 km. A voluminous, dense, mostly white plume with small pulses of ash in its center was observed from a commercial flight two days later. Information Contacts: ICAO; J. Post, SI. Vigorous ash emissions, rising to 300-600 m, were observed from an aircraft on 3 October. Information Contacts: N. MacLeod, Ridgefield WA, USA. An aviation report stated that at 1705 on 15 August "smoke" from Raung at an altitude of 6 km was drifting W. Following this report, aviation notices were posted in Indonesia, New Zealand, and Australia for the next 24 hours. No plume was observed by Australian meteorologists on satellite imagery from 1800 on 15 August through 2050 the next day. The last reported eruption, which occurred sometime between January and June 1993, generated an ash column 600 m above the rim and caused ashfall in the surrounding area. Information Contacts: BOM Darwin, Australia. On 10 April an ash cloud was reported drifting to the E at 5 km altitude. The Bureau of Meteorology had learned from the Volcanological Survey of Indonesia that the volcano had been erupting continuously, but ash was ejected only ~ 150 m above the crater. On 1 June a Qantas pilot described "smoke" at 6.1 km, drifting W. Similar reports were received on 18 and 22 June, but heavy clouds hampered the detection of ash in satellite imagery. Information Contacts: Bureau of Meteorology, Northern Territory Regional Office, P.O. Box 735, Darwin NT 0801, Australia. At 1720 on 9 July 2000 an air report to the Darwin VAAC noted an ash cloud near Raung with a growing plume at an unknown height. The plume discharged from Raung. Visible satellite imagery taken at 1630, hours before the air report was made, disclosed Raung surrounded by scattered low clouds, with a possible low-level ash plume extending 25 km to the NW. There was no evidence of ash in subsequent satellite imagery. No signs of activity were observed at Raung by Lee Siebert when passing nearby on commercial aircraft at about noon on 10 July and mid-morning on 11 July. Information Contacts: Darwin VAAC, Bureau of Meteorology, Northern Territory Regional Office, PO Box 40050, Casuarina Northern Territory 0811 Australia (URL: http://www.bom.gov.au/info/vaac/); Lee Siebert, Global Volcanism Program, Smithsonian Institution, Washington, DC 20560-0119 USA. On 2 June 2002 at 1625, a pilot reported observing an ash plume emitted from Raung. The plume rose to a height of ~4.5 km altitude and drifted to the S. According to the Darwin VAAC, ash clouds were visible on satellite imagery a few days later. The clouds were at heights below 4.6 km altitude and were observed on 5 June at 0840 drifting S, on 7 June at 0934 drifting SW, and on 8 June at 1132 drifting NW. According to the Volcanological Survey of Indonesia (VSI), Raung has been erupting for at least a decade, and recent eruptions are events within a single, broader eruptive period. Thus, the above-noted ash eruptions from June were noteworthy outbursts within a longer sustained eruption. Information Contacts: Darwin Volcanic Ash Advisory Center (VAAC), Bureau of Meteorology, Northern Territory Regional Office, PO Box 40050, Casuarina, NT 0811, Australia (URL: http://www.bom.gov.au/info/vaac/); Nia Haerani, Volcanological Survey of Indonesia (VSI), Jalan Diponegoro No. 57, Bandung 40122, Indonesia (URL: http://www.vsi.esdm.go.id/). Raung volcano was last discussed in BGVN 27:07, when a pilot reported ash plumes to 4.6 km altitude in early June 2002. That issue of theBulletin also noted a Volcanological Survey of Indonesia (VSI) comment that Raung had been erupting for at least a decade, with recent eruptions being events within a single, broader eruptive period. The Darwin Volcanic Ash Advisory Center (VAAC) subsequently received reports that on 12 August 2002 ash was visible drifting NW of Raung around the summit level. The summit was partially obscured by clouds and no ash was identified on satellite imagery. On 25 August 2002, based on pilot observations and satellite imagery, the VAAC reported a visible ash plume rising to about 9.2 km, drifting to the W at high levels and to the E at lower levels. The Darwin VAAC has an archive of their reports available on their website. Those for Raung are summarized in table 1. The last set of reports (25 August 2002) discussed a plume becoming increasingly diffuse over a 16.5-hour interval. Table 1. Dates and principal comments in Darwin VAAC reports concerning Raung, July 1999-February 2004. Dates and times are not local but instead refer to the Prime Meridian, for example 04/2240Z means the fourth day of the stated month at 2240 UMT. Similar or duplicate message are not shown. In general, ash cloud trajectory information has been omitted. In a few cases the VAAC delineated bounding area surrounding an observed ash cloud ("OBS ASH CLOUD"), delineated with a series of latitude and longitude coordinates (eg. S00700, E11000; which translates to 7 degrees S, 110 degrees E). In the original reports, altitudes were given in shorthand (eg. FL 100, which corresponds to 10,000 feet altitude; 3,048.0 m altitude, but typically not known to better than two significant figures and thus here rounded to ~ 3.0 km altitude). Courtesy of the Darwin VAAC. 30 Jul 1999 INFORMATION SOURCE: AIREP reported plume height to FL 150 [~4.6 km altitude] and drifting to SW.
ASH CLOUD: 30/1025UTC IR satellite imagery shows cloud in the area with possible extension to the SSW. Nature of this extension not discernable. 09 Jul 2000 INFORMATION SOURCE: AIREP QFA123. ERUPTION DETAILS: Ash cloud active with growing plume reported at 09/0920 UTC. Height unknown. ASH CLOUD: Visible satellite imagery at 09/0830 UTC shows Mt. Raung surrounded by scattered low- level clouds with a possible low-level ash plume extending 25 kilometres to the northwest. No evidence is visible on subsequent imagery. 02 Jun 2002 INFORMATION SOURCE: AIREP QANTAS, GMS Satellite Imagery. ERUPTION DETAILS: Ash plume to FL150 [~4.6 km altitude] reported 02/0825Z, drifting south at 15 knots. OBS ASH CLOUD: Ash cloud not identifiable from satellite data. 05 Jun 2002 INFORMATION SOURCE: Satellite Imagery. ERUPTION DETAILS: Possible ash cloud below FL150 [~4.6 km altitude] drifting south at 10/15 knots. OBS ASH CLOUD: Ash cloud identifiable from satellite data. 07 Jun 2002 INFORMATION SOURCE: Satellite Imagery. ERUPTION DETAILS: Possible ash cloud below FL150 [~4.6 km altitude] drifting SW at 10/15 knots. OBS ASH CLOUD: Ash cloud identifiable from satellite data extending SW from Ruang 10NM either side of a line S0800 E11400 S0850 E11360. 12 Aug 2002 INFORMATION SOURCE: AIREP QFA29 via QANTAS OPERATIONS, GMS/NOAA satellite. ERUPTION DETAILS: Ash plume to FL120 [~3.7 km altitude] reported at 12/0920Z, drifting northwest. OBS ASH CLOUD: Ash cloud not identifiable from satellite data. Summit partially obscured by cloud. 25 Aug 2002 INFORMATION SOURCE: AIREP QFA29, NOAA16 SATELLITE. ERUPTION DETAILS: Ash plume to FL300 [~9.1 km altitude] reported 25/0734Z drifting west, low-level drift towards the east. OBS ASH CLOUD: S0807 E11402 S0812 E11342 S0807 E11335 S0800 E11347 S0807 E11402. 25 Aug 2002 INFORMATION SOURCE: AIREP QFA29, NOAA16 SATELLITE, GMS SATELLITE. OBS ASH CLOUD: FL100/350 [~10.7 km altitude] S0735 E11122 S0817 E11119 S0805 E11017 S0731 E11031 S0735 E11122. 25 Aug 2002 ERUPTION DETAILS: Ash plume to FL300 [~9.1 km altitude] reported 25/0734Z drifting west, low-level drift towards the east. OBS ASH CLOUD: FL100/350 [~10.7 km altitude] S0700 E11000 S0800 E11000 S0800 E10630 S0700E10630 S0700 E11000. Ash cloud getting more diffuse and difficult todefine with satellite imagery. 25 Aug 2002 INFORMATION SOURCE: AIREP QFA29. NOAA/GMS SATELLITE. OBS ASH CLOUD: Ash cloud not visible on satellite imagery. Though frequently active, Raung is seldom the subject of reports from either the news media or the Directorate of Volcanology and Geological Hazard Mitigation (DVGHM). The most recent Darwin VAAC report was issued late on 26 August 2002 (UTC). It noted that aviators had estimated an ash plume at ~ 10 km altitude drifting W (reported 25 August in an AIREP). Ash clouds were not visible on NOAA/GMS satellite imagery. A summary of Darwin VAAC reports of Raung for the period July 1999-August 2002 was given in BGVN 29:01. There were nine anomalous Moderate Resolution Imaging Spectroradiometer (MODIS) observations of volcanic hot spots at Raung during 3 June-8 October 2004 (table 2). The 2004 alerts were the first detected by MODIS at Raung. Minor explosive activity documented intermittently during 1999 to 2002 (BGVN 29:01) did not have a thermal component sufficient to trigger alerts. Table 2. Thermal anomalies at Raung observed with MODIS during 2004. Some of the UTC times were for the previous date. Spectral radiance for the hot pixels in band 21 (central wavelength of 3.959 µm) are in units of watts per square meter per steradian per micron (W-2 sr-1 µm-1). Courtesy of the Hawaiian Institute of Geophysics and Planetology. No ground observations have been reported during 2004, but in a message from Dali Ahmad (DVGHM), he noted the absence of observed emissions during 2004. With respect to the thermal alerts, he speculated that they could conceivably have originated from brush fires. Rob Wright commented that the levels of radiance in the 2004 alerts were both "too weak and too intermittent to be lava flows" and stood near the system's lower threshold. Similar weak anomalies occur at volcanoes such as Villarrica and during intervals at Anatahan, but the source of the alerts at Raung remains uncertain. Clear aerial photographs of Raung were taken on 26 and 30 July 2001 (figure 2) by Franz Jeker of Singapore Airlines as he flew past in descent towards, or ascent from, the Bali airport. Jeker also included a detailed map of the Raung area (figure 3). Figure 2. A photograph taken on 26 July 2001 of a small fumarolic plume from the central crater of Raung looking SW during a fly-by of a commercial airplane across the NNE flank. Courtesy of F. Jeker. Figure 3. Map showing relative locations of Raung volcano at the SW end of Java, and adjacent Bali. Courtesy of F. Jeker. Information Contacts: Directorate of Volcanology and Geological Hazard Mitigation (DVGHM), Jalan Diponegoro 57, Bandung 40122, Indonesia (URL: http://www.vsi.esdm.go.id/); Darwin Volcanic Ash Advisory Center (VAAC), Bureau of Meteorology, Northern Territory Regional Office, PO Box 40050, Casuarina, NT 0811, Australia (URL: http://www.bom.gov.au/info/vaac/); Hawai'i Institute of Geophysics and Planetology (URL: http://modis.higp.hawaii.edu); Franz Jeker, Rigistrasse 10, 8173 Neerach, Switzerland. Nine anomalous Moderate Resolution Imaging Spectroradiometer (MODIS) observations of volcanic hot spots were reported during 3 June-8 October 2004 (BGVN 30:01). No other activity was reported from Raung until 26 July 2007. That day the Darwin Volcanic Ash Advisory Center (VAAC) indicated that a pilot had observed an ash plume, possibly from Raung, which their ash advisory reported as follows: "AIREP [an aircraft observation] reported ash cloud observed over volcano on eastern tip of Java. Plume up to 5000 feet [~ 1.2 km] above summit. Volcano assumed to be Raung. Ash not seen on latest satellite pass due to cloud." Darwin VAAC produced five reports in reference to a Raung ash plume emitted on 26 August 2007. Visible wavelength imagery on MT SAT disclosed a plume at FL 150 (15,000 feet, or 4.6 km altitude) drifting E at ~ 10 km/hr (at 0430 UTC on 26 August). The last view of the cloud was reported at 0833 UTC, still at the same altitude and moving at the same velocity. That plume rose to an altitude of 1.5 km. Ash was not visible on satellite imagery. The Darwin VAAC reported that satellite imagery had detected an ash plume from Raung during 26-27 August that rose to an altitude of 4.6 km and drifted E.
Information Contacts: Darwin Volcanic Ash Advisory Center, Bureau of Meteorology, Northern Territory Regional Office, PO Box 40050, Casuarina, Northern Territory 0811, Australia (URL: http://www.bom.gov.au/info/vaac/). In an Antara News report, Balok Suryadi, an observer at the Center of Volcanology and Geological Hazard Mitigation (CVGHM) Raung monitoring post at Sumber Arum village, described clouds of "smoke and ash" that occurred on 12 and 13 June. He was also quoted in the 19 June article as saying that activity was "likely" continuing but that it could not be clearly monitored from the observation post. Another ash eruption was seen rising through the clouds on 17 June 2008 around 1500. This event was photographed by Karim Kebaili while flying from Bali to Jakarta approximately 30 minutes after take-off (figure 4). The same eruption was seen at 1430 by pilot Nigel Demery, who stated that the ash cloud initially rose to about 4.5 km altitude but had dissipated on his return flight about two hours later. The Darwin VAAC was unable to identify the plume in satellite imagery due to meteorological clouds. Figure 4. Ash plume rising from Raung at about 1500 on 17 June 2008. Courtesy of Karim Kebaili. Thermal anomalies were detected by the MODIS instrument aboard the Terra satellite on 23 July 2005 and 15 August 2005. No additional thermal anomalies were detected through the end of June 2008. However, ash plumes were reported by pilots on 26 July 2007 and seen in satellite imagery on 26 August 2007 (BGVN 32:09). Information Contacts: Rebecca Patrick, Darwin Volcanic Ash Advisory Centre (VAAC), Bureau of Meteorology, Northern Territory Regional Office, PO Box 40050, Casuarina, Northern Territory 0811, Australia (URL: http://www.bom.gov.au/info/vaac); Center of Volcanology and Geological Hazard Mitigation (CVGHM), Jalan Diponegoro 57, Bandung 40122, Indonesia (URL: http://www.vsi.esdm.go.id/); Nigel Demery, Indonesia; Karim Kebaili, Indonesia; Antara News (URL: http://www.antara.co.id/); Hawai'i Institute of Geophysics and Planetology (HIGP) Thermal Alerts System, School of Ocean and Earth Science and Technology (SOEST), Univ. of Hawai'i, 2525 Correa Road, Honolulu, HI 96822, USA (URL: http://modis.higp.hawaii.edu/). Raung, one of Java's most active volcanoes, is a massive stratovolcano in easternmost Java that was constructed SW of the rim of Ijen caldera. The unvegetated summit is truncated by a dramatic steep-walled, 2-km-wide caldera that has been the site of frequent historical eruptions. A prehistoric collapse of Gunung Gadung on the W flank produced a large debris avalanche that traveled 79 km, reaching nearly to the Indian Ocean. Raung contains several centers constructed along a NE-SW line, with Gunung Suket and Gunung Gadung stratovolcanoes being located to the NE and W, respectively. There is data available for 69 Holocene eruptive periods. There is no Deformation History data available for Raung. There is no Emissions History data available for Raung. Eruption plumes above Raung volcano were observed from commercial aircraft on September 10 and 12 and October 3, 1991. Although the initial report was of flank vent activity, photographs such as this one on September 12 taken from the south, show the eruption cloud originating from the summit caldera and the plume being dispersed by the wind to the NW. 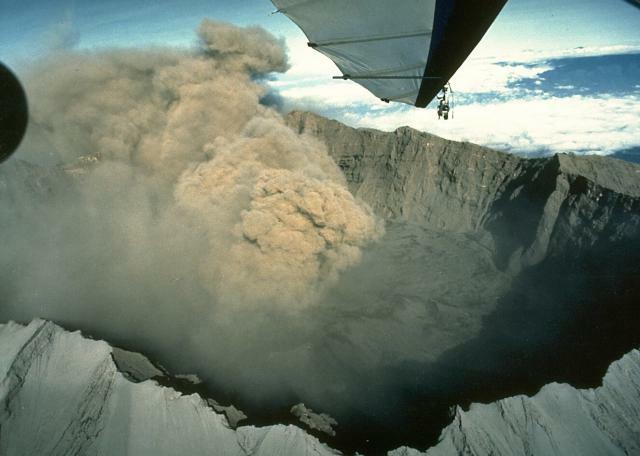 An ash plume originating from a caldera-floor cinder cone rises above the rim of the 2-km-wide Raung caldera in July 1988 as photographed from an ultra-light aircraft. 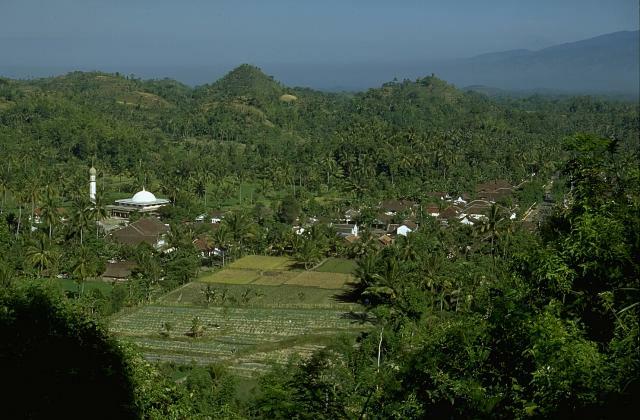 Raung erupted frequently between 1987 and July 1989. 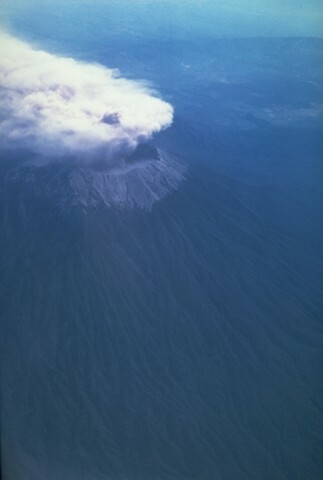 An eruption plume from a cinder cone on the floor of the 2-km-wide Raung caldera rises high above the caldera rim in July 1988. 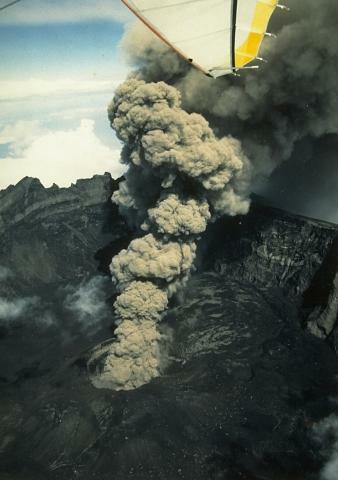 Frequent explosive eruptions occurred at Raung from 1987 through July 1989. During August and September 1988 more than 300-400 individual eruptions were recorded. Raung volcano, near the eastern tip of Java, is truncated by a steep-walled, 2-km-wide caldera. 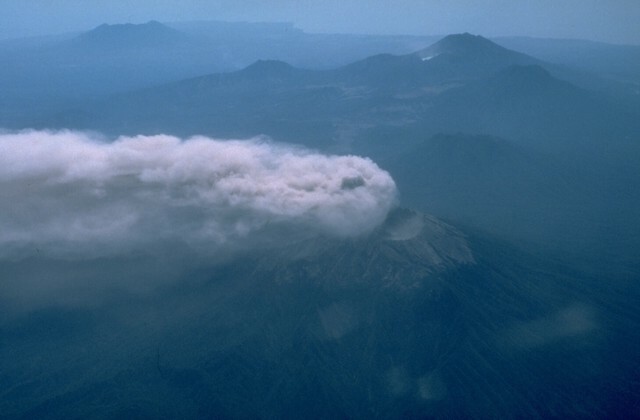 One of Java's most active volcanoes, Raung produces frequent moderate explosive eruptions, like this one in 1988 from a cone within the caldera, that keep the upper flanks of the volcano sparsely vegetated. Raung forms part of a NW-SE-trending chain of volcanoes constructed near the SW rim of the massive Ijen caldera. 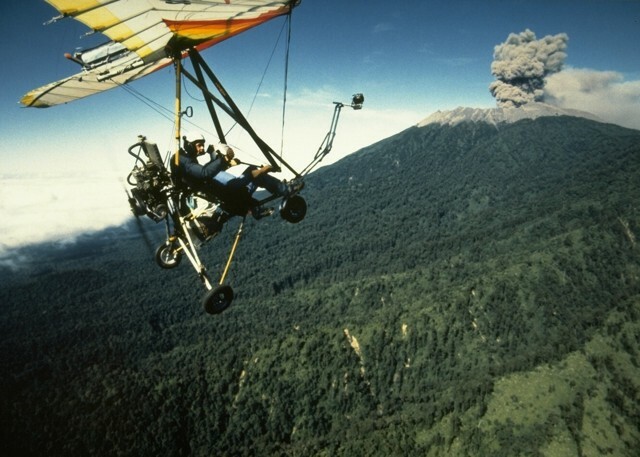 An ultralight aircraft was used by scientists from France and the Volcanological Survey of Indonesia to monitor eruptions from Raung volcano in 1988. This July view shows an ash-rich plume rising above the forested northern flank of Raung volcano. Hundreds of explosive eruptions were recorded during August and September 1988. This eruption began in 1987 and continued into 1989. 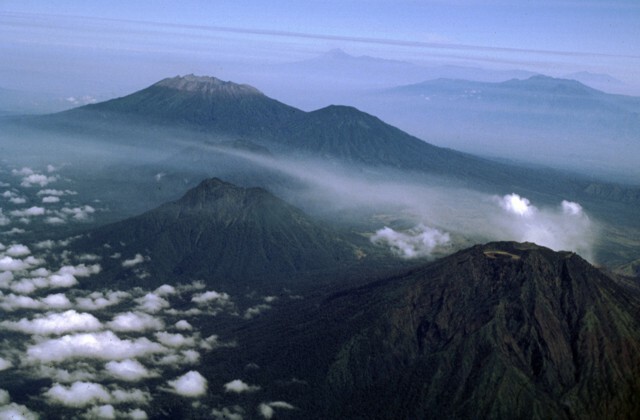 This composite photo shows the steep-walled, 2-km-wide summit caldera of Raung volcano. A steaming, 90-m-high cinder cone on the caldera floor at the left formed beginning in 1902 and is the source of recent explosive eruptions from Raung. Fresh lava flows cover the caldera floor. Photo by Igan Sutawidjuja, 1984 (Volcanological Survey of Indonesia). 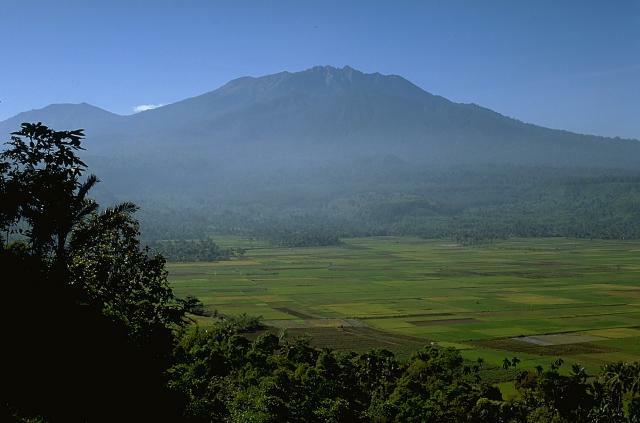 A massive 8.5 x 13 km wide caldera, whose floor is seen here partly covered with rice fields, formed as a result of collapse of Gunung Gadung, a stratovolcano on the west side of Raung volcano. The collapse, whose northern and southern walls form cliffs at the left and right sides of the photo, produced one of the world's largest subaerial debris avalanches, which reached nearly to the Indian Ocean. Three generations of volcanoes are visible in this view from the west flank of Raung volcano. 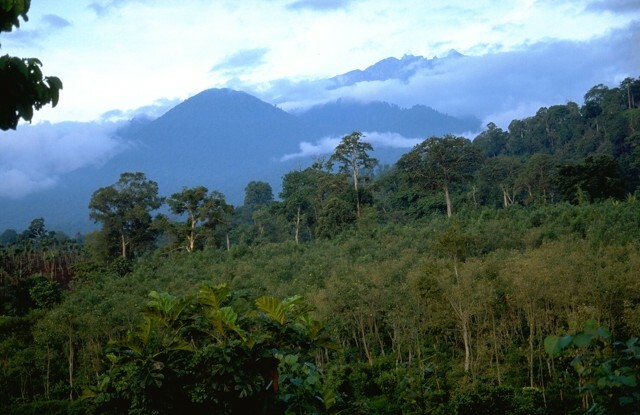 The rounded forested peak at left center is Gunung Pajungan, a small stratovolcano that grew near the headwall of a massive horseshoe-shaped caldera produced by gravitational collapse of Gunung Gadung. The arcuate ridge to the right of Gunung Pajungan is the headwall of the massive 8.5 x 13 km landslide scarp that cuts Gunung Gadung. Behind it, above the clouds, is the rim of the historically active summit caldera of Raung volcano. The hilly terrain is part of a massive debris-avalanche deposit formed as a result of collapse of Gunung Gadung stratovolcano on the west side of Raung volcano. The massive debris-avalanche deposit has an estimated volume of about 25 cu km. The avalanche banked against the slopes of Iyang-Argapura volcano in the right background and was deflected to the SW, traveling nearly to the Indian Ocean. 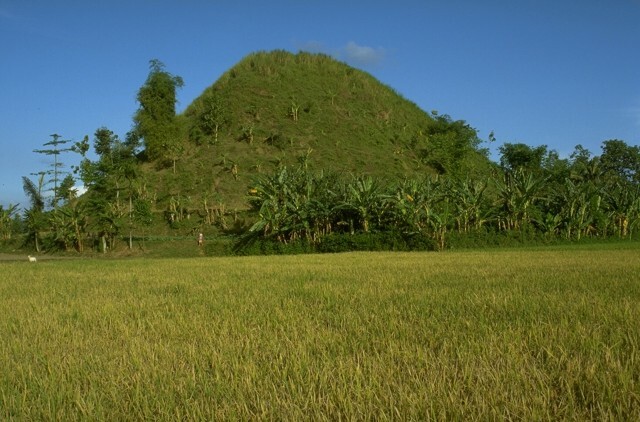 This conical hill, about 20 m high, is not a volcanic cone, but a hummock that is part of a massive debris-avalanche deposit produced by collapse of Gunung Gadung, a stratovolcano on the west side of Raung volcano. The hilly topography produced by the massive landslide extends many tens of km from the volcano. 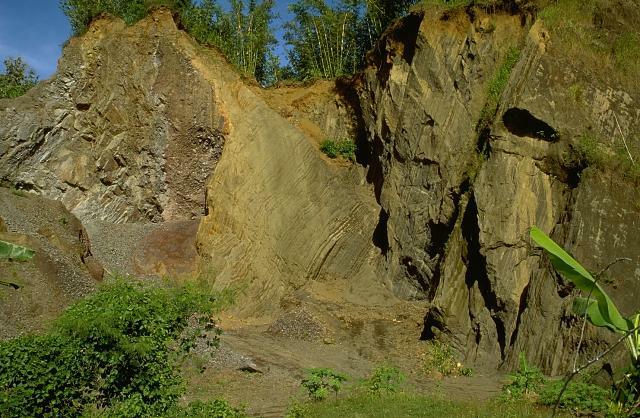 A quarry displays a cross section of a debris-avalanche hummock, showing bedded layers of tephra on the right and a segment of a lava flow on the left. Both the the massive lava and the unconsolidated tephra layers were transported relatively intact for about 30 km within a massive debris avalanche from Raung volcano in eastern Java. The preservation of original stratigraphy from within the volcano is a common feature of debris-avalanche deposits. 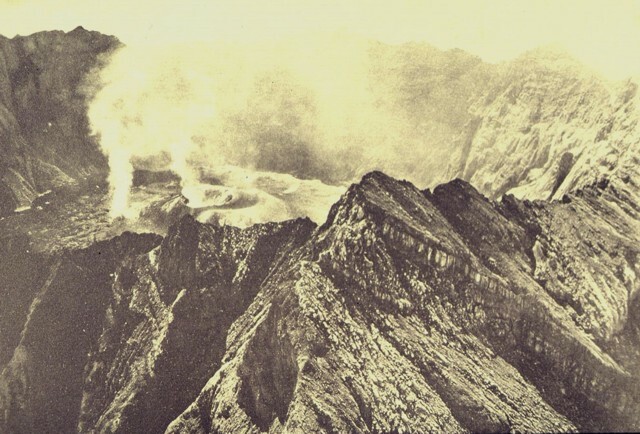 Steam clouds rise above the 1913 crater and a point on its flank in this August 1922 aerial photo of Raung's summit caldera from the NW. A blocky lava flow covers the caldera floor to the left of the 1913 pyroclastic cone. 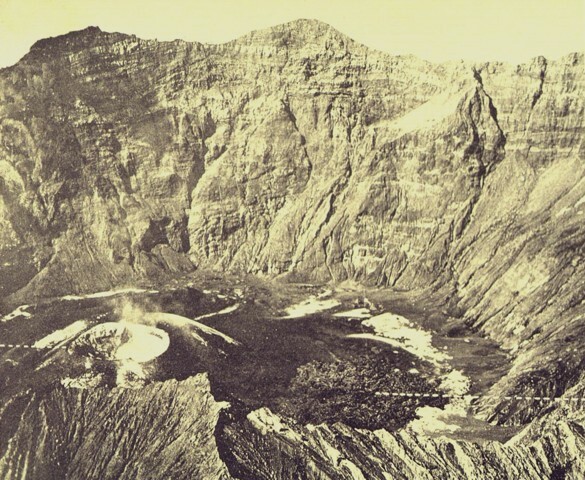 The pyroclastic cone at the lower left on the floor of Raung's summit caldera formed during an eruption in 1913. A lava flow erupted from the cone extends to the right across the caldera floor. This aerial photo, taken sometime before 1926, shows the steep, roughly 500-m-high SW caldera wall in the background. There are no samples for Raung in the Smithsonian's NMNH Department of Mineral Sciences Rock and Ore collection. Large Eruptions of Raung Information about large Quaternary eruptions (VEI >= 4) is cataloged in the Large Magnitude Explosive Volcanic Eruptions (LaMEVE) database of the Volcano Global Risk Identification and Analysis Project (VOGRIPA).